CHATTANOOGA, TN--(Marketwired - Jun 6, 2013) - Diligently staying abreast of practices to help maintain environmental sustainability, a prominent Chattanooga extended stay hotel has received certification through the Tennessee Green Hospitality program. In attaining the designation of Tennessee Green Hospitality Certified, the TownePlace Suites Chattanooga Near Hamilton Place has implemented practices that greatly reduce the hotel's impact on the environment by using techniques proven to reduce waste. The Tennessee Green Hospitality program promotes and supports Tennessee's vision to be a more sustainable state while also giving guests the assurance that active programs are in place to ensure positive action is being taken toward sustainability. By pledging to "reduce, reuse and recycle," this stylish Chattanooga, TN lodging provides guests the comfort of knowing they are helping to create a sustainable environment during their stay. Implementing recycling for guests in public spaces throughout the hotel. Offering linen and terry re-use programs in all guest rooms to cut down on chemical and water usage. Participation in the Global Soap Project program to recycle used bars of soap into clean soap for third world countries. Certification of the refreshing Chattanooga, TN accommodations offered at the TownePlace suites, affirms to guests that the diligent efforts of the staff and management have resulted in a significant level of sustainability and that practices are in place to ensure continued improvement. The first TownePlace Suites to be Tennessee Green Hospitality Certified, the property's studio suites include fully equipped kitchens, living and dining space as well as an expansive office area so guests can enjoy home-like comforts while on the road. Conveniently located near Hamilton Place Mall, the Chattanooga hotel provides guests with complimentary WiFi throughout the property and free breakfast served daily in its bright and cheerful breakfast area. The TownePlace Suites Chattanooga Near Hamilton Place welcomes guests with spacious studio suites designed to provide a home away from home that is convenient to many of the city's most popular destinations. 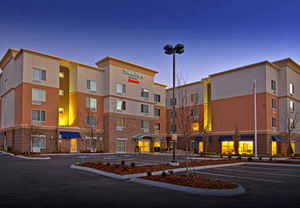 Located just off I-75 and near Chattanooga Metropolitan Airport, the hotel allows guests easy access to business destinations such as the Amazon Distribution Center and Volkswagen, and is also popular among leisure travelers because of its close proximity to the Tennessee Aquarium, Lookout Mountain and the Tennessee Valley Railroad Museum. Guests are also pampered with 24-hour access to the hotel's fitness and business centers, while the outdoor patio with fire pit and barbecue grill is ideal for relaxing with family and friends. Diligently staying up-to-date with practices to help maintain environmental sustainability, the TownePlace Suites Chattanooga Near Hamilton Place has received certification through the Tennessee Green Hospitality program.